The Upaniṣads are treasure-houses of wisdom. They are religious treatises of Ancient India as practised and found by its great seers and sages. The term Upaniṣad is derived from the root ‘sad’ (ṣadṛ) meaning to sit, with the prepositions ‘upa’ and ‘ni’ in the sense of sitting down of the disciple near his teacher in a devoted manner to receive instruction about highest reality which loosens all doubts and destroys all ignorance. The Upaniṣads are the final and most important parts of the Vedas. They contain the philosophical thoughts of ancient Indians and form the bedrock of many systems of Indian philosophy. They are the end and aim of the Vedas and are found at the end of each of the four Vedas and hence they are termed Vedanta. The Mantras constitute the first phase, the Brāhmaṇas the second, the raṇyakas the third, and the Upaniṣads at the end of the Veda. Due to the tremendous progress in the field of material sciences which resulted in coming of age of archeology, epigraphy, carbon dating and others as viable scientific methods. The impact of this transformation resulted in the emphasis that valid history can only be based on material artifacts like pottery, inscriptions and other tangible material evidences and not tradition, folk lore etc. Hence the modern historians relegated all that was oral history into mythology. For them mythology was an art from for cultural entertainment rather than to be considered as serious history of a culture or civilization. Hence history became, instead of a robust lively narration of the story of cultures of our forefathers, a mere skeleton of facts and figures with very little possibility of a valid impact on the psyche of the society. Hence in modern time’s, history lost its prime position of importance as a guide to formulate the opinions of the people in order to preserve the culture and traditions that are unique to each civilization. Bharata was no exception. Even though it was acknowledged as the repository of the most ancient poetical creation namely the Vedas and was acknowledged to be one of the most ancient civilizations of the world all Its oral records were relegated as pure mythology – a figment of imagination of the ancients. So was the fate of the history of the river Sarasvati. Even though the traditional texts of Bharata from the Vedas on wards spoke about a mighty river called Sarasvati, by the time the modern historians tried to look at the history of Bharata sarasavati had disappeared. So all information associated with river Sarasvati was relegated to the background. It had scant attention of the academic world for a long time. She became a myth. But river Sarasvati continued to be a reality in the minds of the masses of Bharata as a sacred river who had gone underground. Fairs, melas were celebrated at places of pilgrimage believed to be on the banks of river Sarasvati during the rainy season. People believed that river Sarasvati would appear in the tanks and ponds during the rainy season at the places of pilgrimage to bless them and would throng to take bath and feel sanctified by the waters of river Sarasvati. tena tyaktena bhūñjītha mā gṛtha kasyasviddhanam. The whole moving world of moveables is pervaded by God. Renouncing like that enjoy or be satisfied; covet not the wealth of anyone. Īśopaniṣad is quite small containing only 18 mantras. In eighteen mantras it gives a very good account of the tman. The Īśopaniṣad embodies in its very opening verse the central theme of all the Upaniṣads, namely, the spiritual unity and solidarity of all existence. It brings about the reconciliation between action and inaction or pravṛtti and nivṛtti as they are otherwise called. It advises that every being is pervaded by the Lord or Master and so one should enjoy the pleasures of life with utmost detachment and with a sense of sharing and covetedness or avarice should be eschewed. Briefly stated, the first two hymns emphasise the all-pervasive character of the Supreme Being, Brahman and the need of performance of karma in a disinterested way as subsidiary to the spiritual discipline sādhana for attaining God. The next six hymns (3-8) expound the true nature of the Paramātman and also that of the upāsaka or the one who embarks on meditation. The subsequent six hymns (9-14) teach the nature of sādhana or means of attainment of mokṣa and in particular, the place of karma or the performance of prescribed deeds in the spiritual discipline. The last four hymns (15-18) are in the form of prayers intended for the meditation upon paramātman by the aspirant seeking mokṣa. This Upaniṣad also emphasises the importance of doing one’s duty and exhorts the people to wish to live for a hundred years doing their duty. It teaches that a person who does his duty without selfish ends is not bound by Karman. One who sees the whole world, will never loath the existence according to this Upaniṣad. keneṣitaṃ patati preṣitaṃ manaḥ, kena prāṇaḥ prathamaḥ praiti yuktaḥ￿ keneṣitāṃ vācamimāṃ vadanti, cakṣuḥ śrotraṃ ka u devo yunakti.1. This Upaniṣad is in the form of a guru-disciple dialogue, is spread over four parts or khaṇḍas with a total of 35 mantras Kena in Sanskrit implies a question, by whom? The Kena illumines the nature of knowledge by pointing out the eternal knower behind all acts of knowing, and purifies man’s concept of ultimate reality of all touch of finitude and relativity by revealing its character as the eternal Self of man and the Self of universe. The Upaniṣad is divided into four parts. The first two parts are in the form of dialogue, and explain how one can arrive at the ātman through the analysis of perception. They suggest that the ātman or the absolute consciousness can be intuited by detaching it from the functions of mind and senses. It can be done only by intuitive faculty of the ātman itself, for the senses are utterly incapable of perceiving it. na vidmo na vijānīmo yathaitadanuśiṣyāt .. 1.3 ..
That subtle cause, that eye of the eye is not seen, because our eye has no jurisdiction there. Neither the mind or the speech has the ability to reach it. This Upaniṣad asks the student to try to find the inner cause of all abilities which is neither known or unknown,which the language cannot explain, but which creates language and so on with other faculties. According to this Upaniṣad, reality is not cognised by those who think they know it, still it is known to those who think they do not know it. avijñātaṃ vijānatāṃ vijñātamavijānatām .. 2.3 .. In the third part, the principles of the two earlier parts are described in an allegorical form. There the devas stand for the senses. In the fourth part, the Upaniṣad speaks of the subjective and objective ways of meditating on Brahman and of the results of such meditation. The final section of this Upaniṣad has a story. The absolute (Brahman) brought victory to the gods. The gods became arrogant thinking that the victory was theirs. There appeared one Yakṣa, which they could not comprehend. They sent god of fire, Agni, to learn about. Agni went there and boasted about his own power. The Yakṣa asked Agni to burn a straw of grass. Agni tried 2Kenopaniṣad, Sri Ramakrishna Math, Madras, 1953, p. 5 his best, but could not burn it. Indra sent the god of wind, Vāyu. He also could not burn the straw. Finally Indra goes there to find out what the Yakṣa was. Indra saw a beautiful woman, Umā, in the place of Yakṣa. She told him that the Yakṣa was the brahman. This Upaniṣad teaches us that the eye of the eye, ear of the ear, power of all powers is the Brahman. Without that Ablolute’s grace, everything is powerless and meaningless. The Kaṭha has six vallīs (sections). It holds a special fascination for all students of the Upaniṣads for its happy blend of charming poetry, deep mysticism and profound philosphy. This Upaniṣad is a dialogue by the two characters of its dialogue, namely, Yama, the teacher, and Naciketa, the student. It contains the story of Naciketas who learns brahmavidyā from the god of death. Once Naciketa’s father performed a yajña and gave away all his possessions. The boy asked his father “whom are you going to give me to”? Father ignored the question. When the boy persisted in questioning, his father became angry and exclaimed “I am giving you to the god of death”. Naciketa took the word seriously and himself went to the abode of Death. The god of Death, called Yama by name, granted three boons to the boy as compensation for waiting at the door for three nights. First, the boy asks that his father should become calm and give up anger. From the second boon, he wishes to know how ordinary people can reach heaven. The god of Death describes a yajña in detail which is according to him, a sure path to heaven. For the third and final boon, the boy wishes to know the secret of Death i.e., what happens to the soul after death of the body. Yama does not answer immediately. He offers wealth, kingdom, long life and beautiful maidens in lieu of the secret of Death. bhūmermahadāyatanaṃ vṛṇīṣva svayaṃ ca jīva śarado yāvadicchasi.. 1.23 .. The Naciketas does not succumb to any temptation. Knowing that the boy was a fit student to receive the knowledge of the soul, Yama teaches him the ātmavidyā and reveals the secret of Death. The Kaṭhopaniṣad teaches that the good and the pleasant present themselves before every man and woman. If one chooses the good, one will attain permanent bliss. If the pleasant, which appears very attractive, is chosen, it leads to disaster. A wise man chooses the good and ignores the pleasant. śreyo hi dhīro’bhi preyaso vṛṇīte preyo mando yogakṣemādvṛṇīte .. 2.2 .. This Upaniṣad also tells that the soul is a permanent entity and takes numerous bodies in birth according to its own karmas. When the physical body dies, nothing happens to the soul. The Upaniṣad emphasises the importance of moral life and says one cannot reach the ātman without a moral life. The body is compared to the chariot, intellect to the charioteer, mind to the rein, senses to the horses and the soul to the occupier of the chariot. buddhiṃ tu sārathiṃ viddhi manaḥ pragrahameva ca .. 3.1 .. If the horses are under control, one can reach the destination. Otherwise, they may lead him to disaster. Thus the god of death teaches Naciketas the way to immortality. 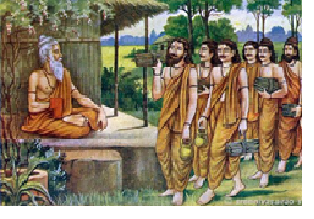 Praśnopaniṣad belongs to Atharvaveda. The Praśna, as its name implies, is an Upaniṣad of questions; each of its six chapters comprises a question asked by each of a group of six inquiring students on various aspects of Vedantā, and the answers given by their teacher, the sage Pippalāda.